Most golfers hit a sand wedge farther than 75 yards and a lob wedge not quite as far. So how do you consistently execute a 75-yard shot that is between clubs? Mark Hackett, Director of Instruction at Old Palm and one of Golf Magazineâs Top 100 Teachers in America, offered this advice in a recent issue of the magazine. 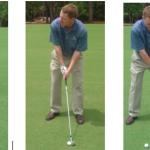 Step OneâSet It Up Use your sand wedge and take a shoulder-wide stance to reduce body turn. Set the shaft so it points to the center of your body. Position the ball slightly behind the middle of your stance. Grip down. Pull your left foot back so the big toe is even with the ball of the right foot. Step TwoâSwing Three Quarter to Three Quarter The set-up will limit your shoulder and hip flexibility, so it will be easy to stop your swing at three-quarters back. Thatâs all most golfers need when using a sand wedge. Step ThreeâConstant Acceleration Donât decelerate the club on the downswing. Smoothly accelerate as if you were hitting the shot full. Step FourâMatch Swing Lengths Since you stopped at three-quarters back, finish at three-quarters through. It should happen automatically. If you try to swing to a full finish, youâll likely fall off balance. Also, remember to keep your wrist hinged 90 degrees just like with full swings. A solid hinge is needed to add energy to the motion and to hit the ball on a high trajectory so that it can fly all the way to your target.